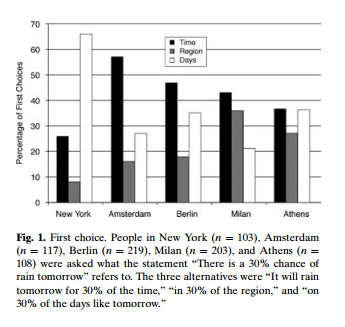 *1："A 30% Chance of Rain Tomorrow": How Does the Public Understand Probabilistic Weather Forecasts? 1. It will rain tomorrow in 30% of the region. 2. It will rain tomorrow for 30% of the time. 3. It will rain on 30% of the days like tomorrow.